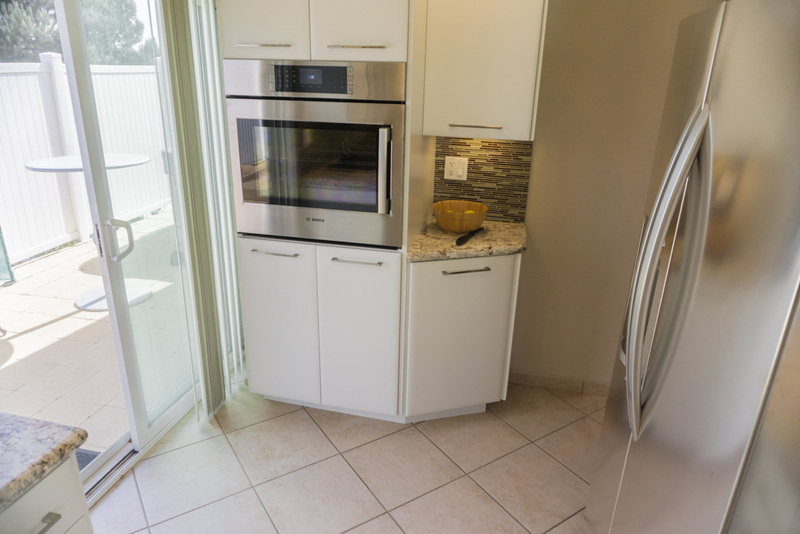 Added wall oven and cabinets to area builder left for a table, but a table blocked the use of the back door, so was impractical (translation: bad original design). 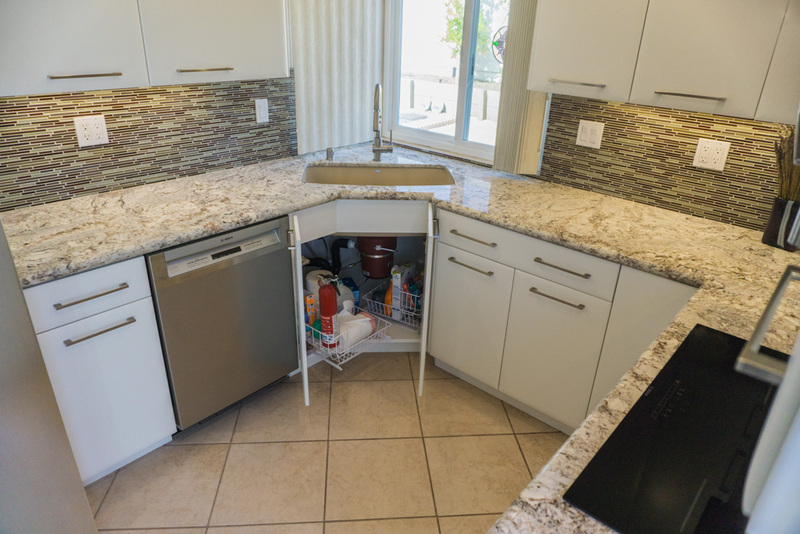 Used corner sink and moved fridge further down the wall since table area was gone, to make more counter space and more storage of both sides of the sink and between sink and cooktop. 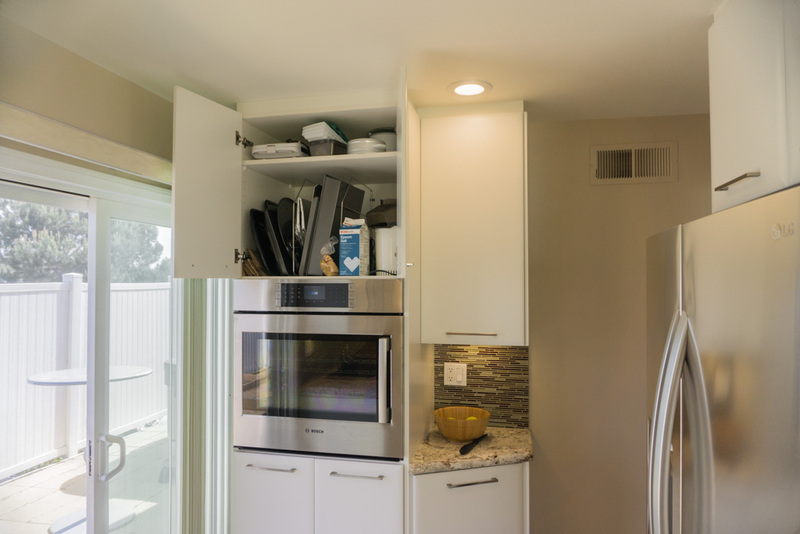 Ran wall cabs to ceiling to create more storage. 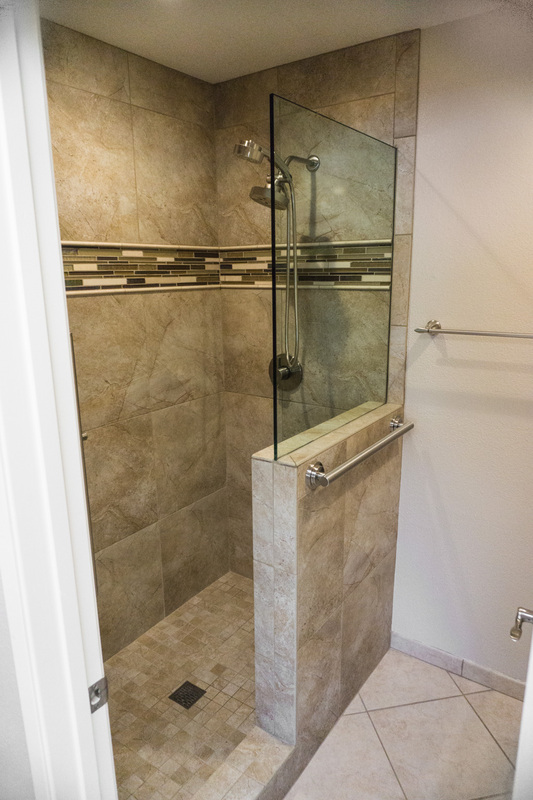 Created new walk-in shower with no door, where builder had installed a builder grade shower with sliding doors. 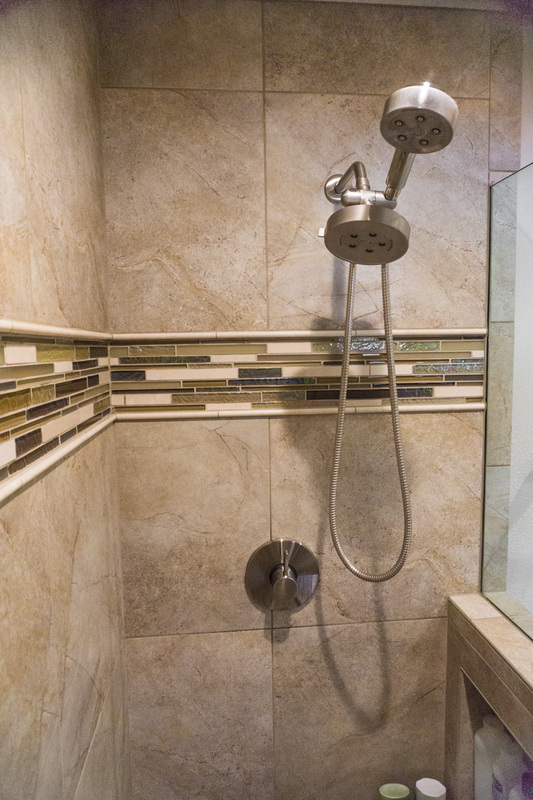 Removed builder grade tub and shower wall and ran new shower wall treatment in Kohler Choreograph collection all the way to the ceiling. 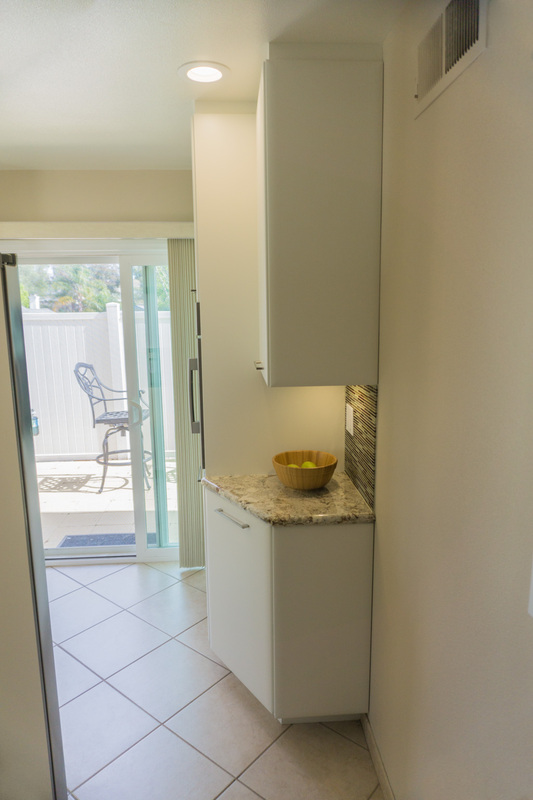 This client moved in to this 30-year-old Chula Vista condo from back east upon retirement. 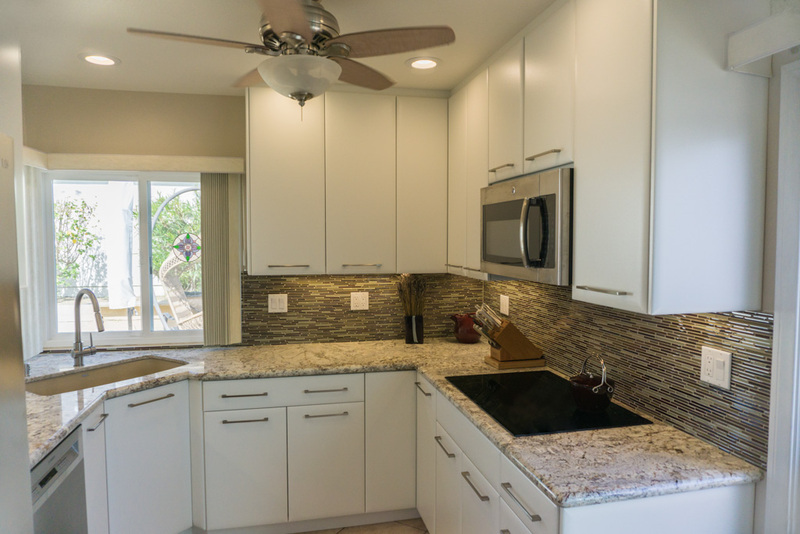 They simply wanted to update the kitchen, a shower and bathtub in two baths, and to make those parts of the home more functional and attractive. 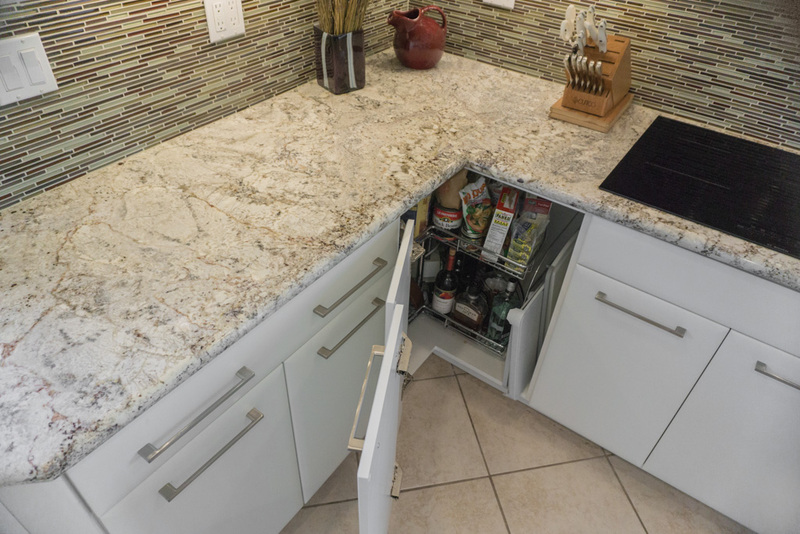 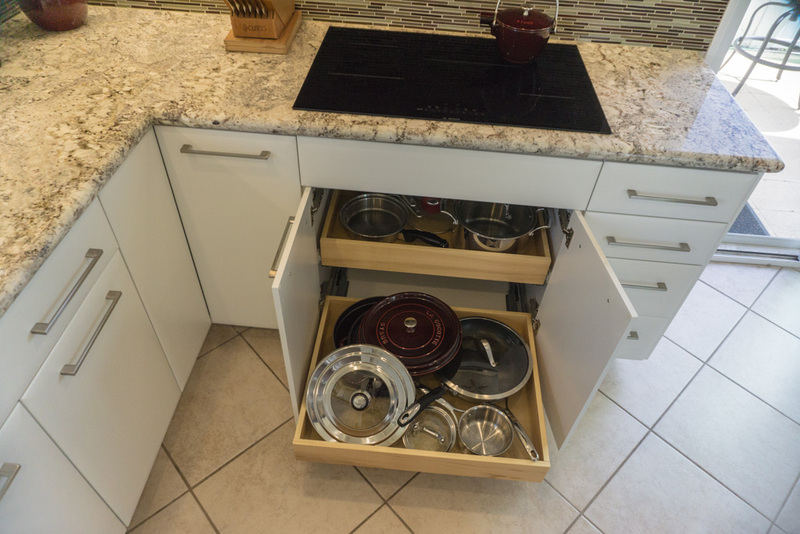 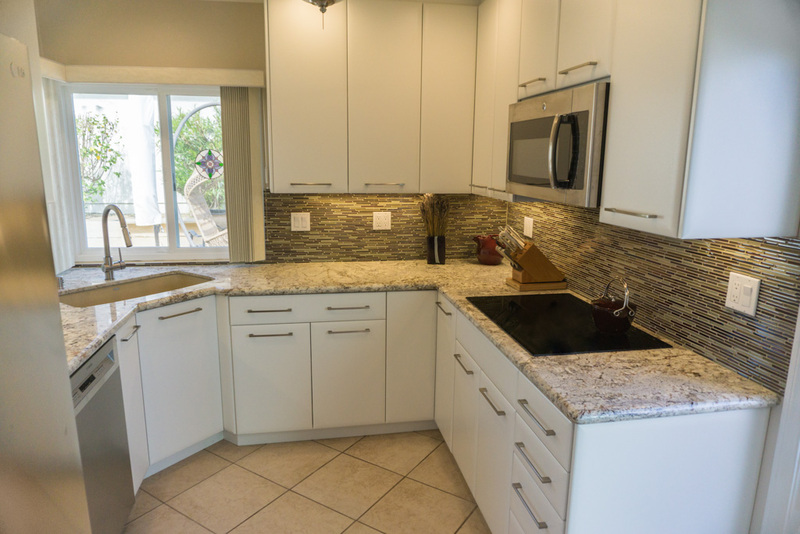 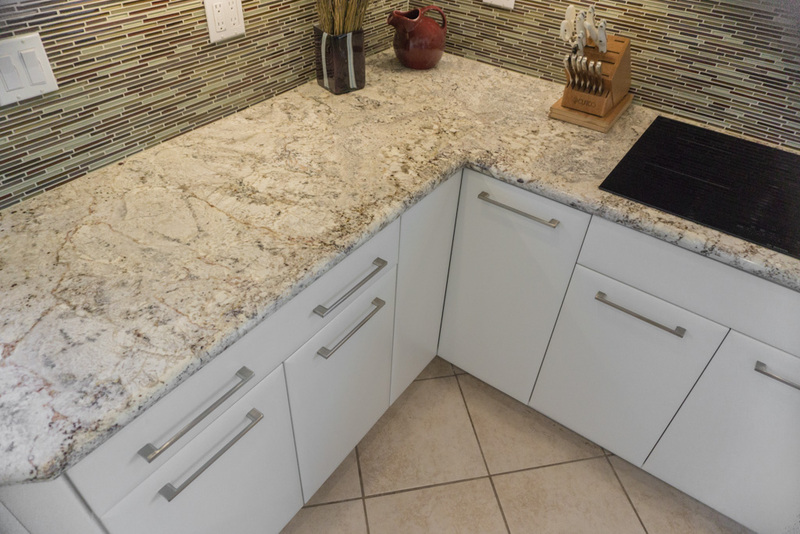 As is the norm in most kitchen projects, the kitchen upgrade included getting more countertops and storage areas in the right places to make the kitchen a lot more functional than the typical builder layout. 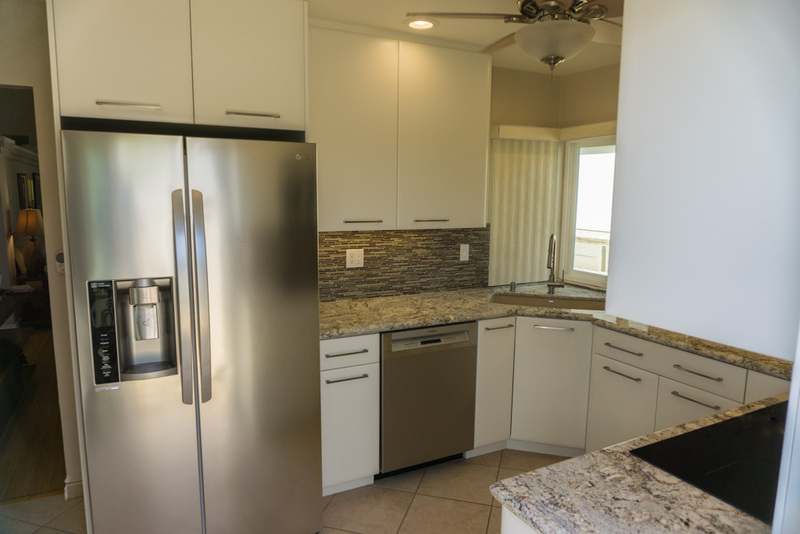 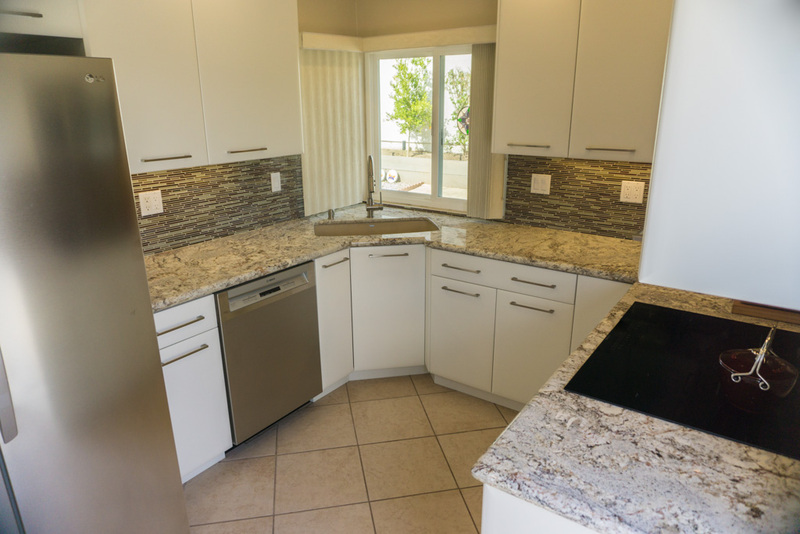 Even though this condo kitchen was not very big to start with, it was expanded by using space the builder had left for an in-kitchen eating table that was in the way of the sliding glass door, and never used for a table by this owner. 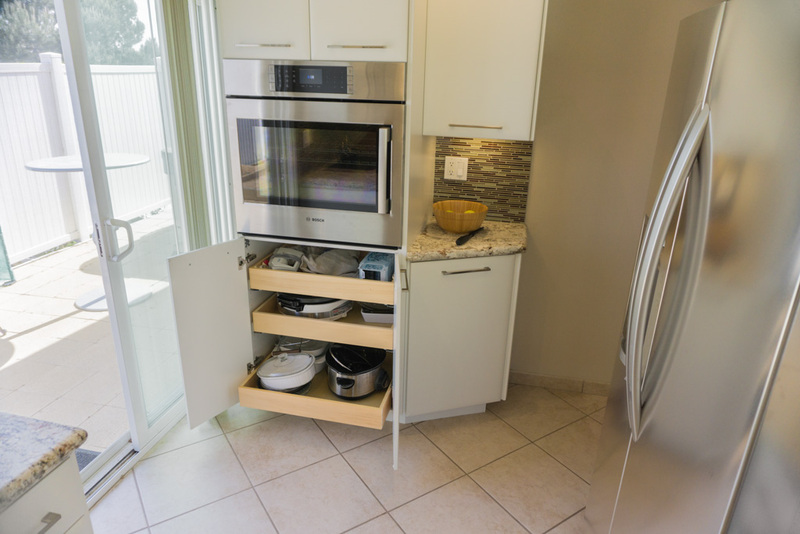 We put the wall ovens on that unused wall to free up more storage near the cooktop for pots and pans. The unique and custom corner sink application in this kitchen allowed very good use of counter and storage on both sides of the sink. 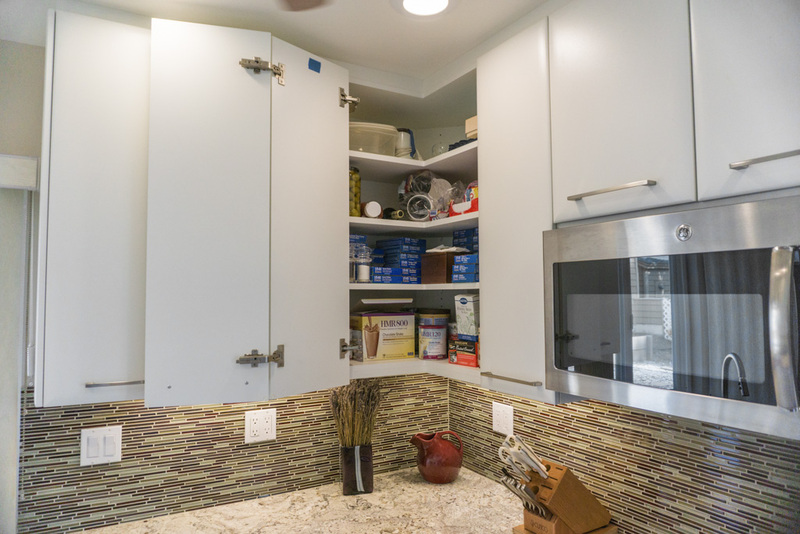 Note the angled wire baskets under the sink to utilize the sink cabinet for storage. 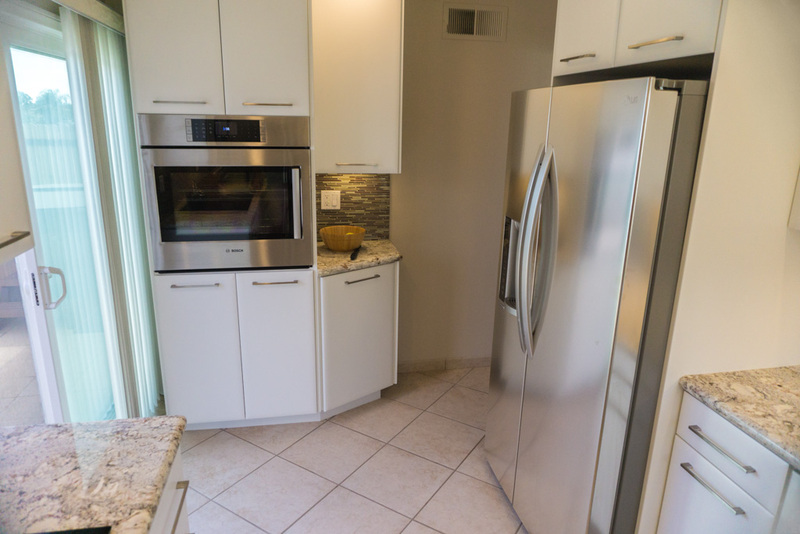 We also moved the refrigerator closer to the dining room doorway since the table area was now gone. 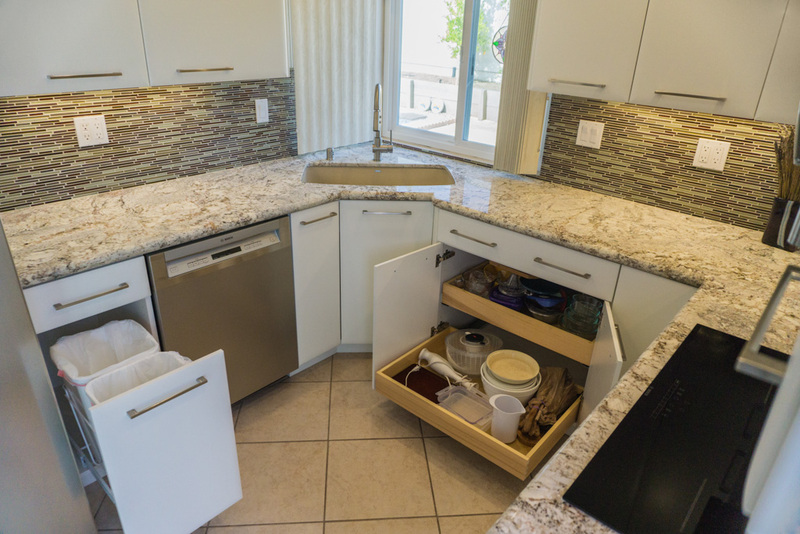 That move is what allowed us to move the sink further from the cooktop than it was originally and create more counter space and storage between the sink and cooktop, and the sink and fridge. 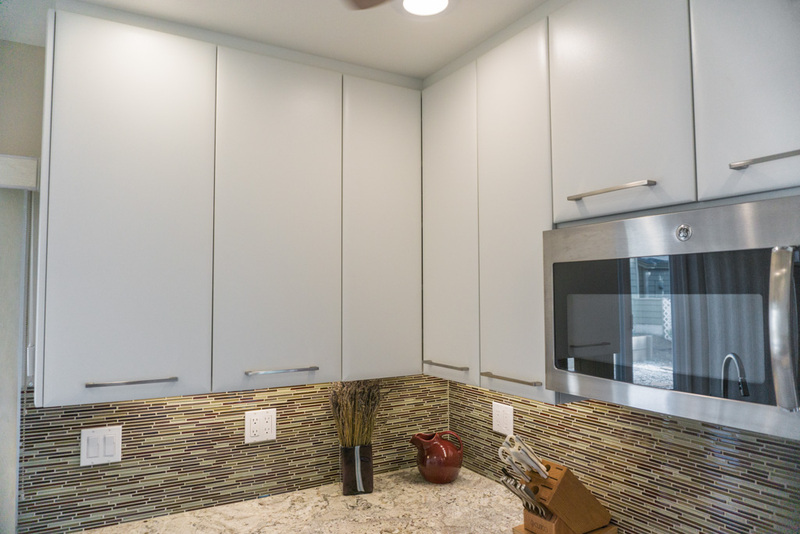 All the new lighting in the ceiling and under cabinet lights are LED’s on dimmer switches. 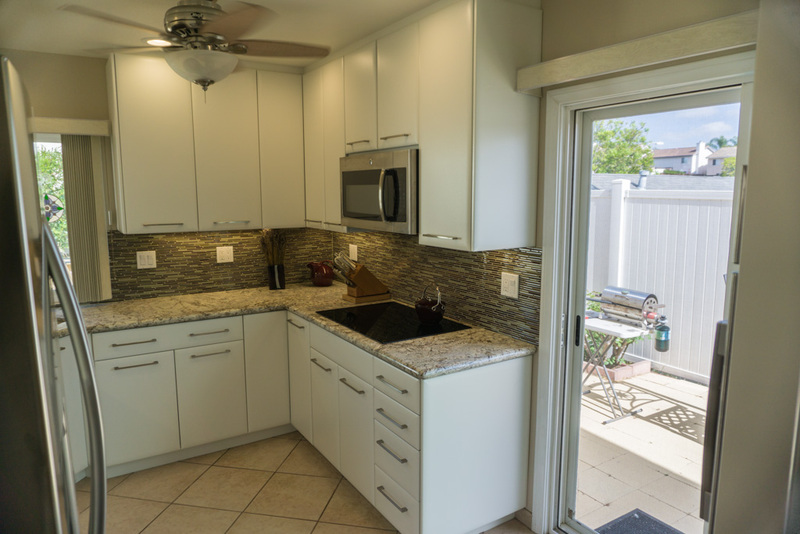 The client chose very simple and modern thermofoil doors for cost, ease of cleaning, and long term durability. 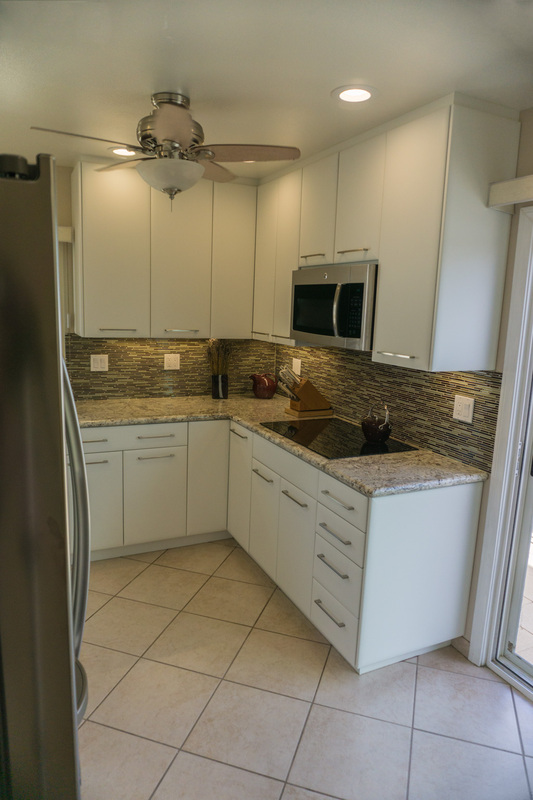 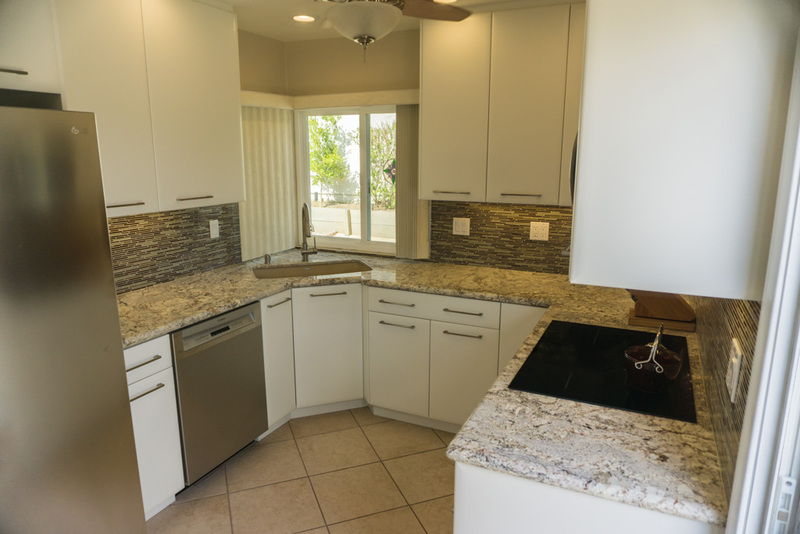 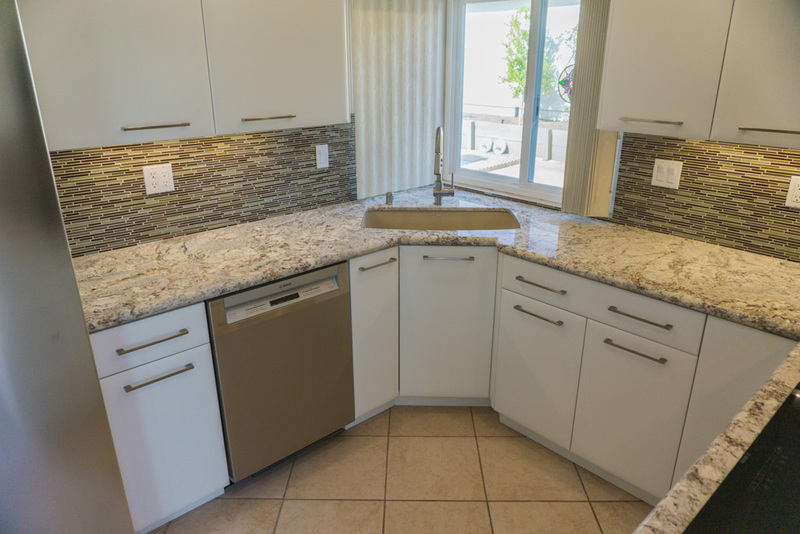 They also chose a natural granite countertop and glass tile mosaic backsplash to complete the sleek modern kitchen look. 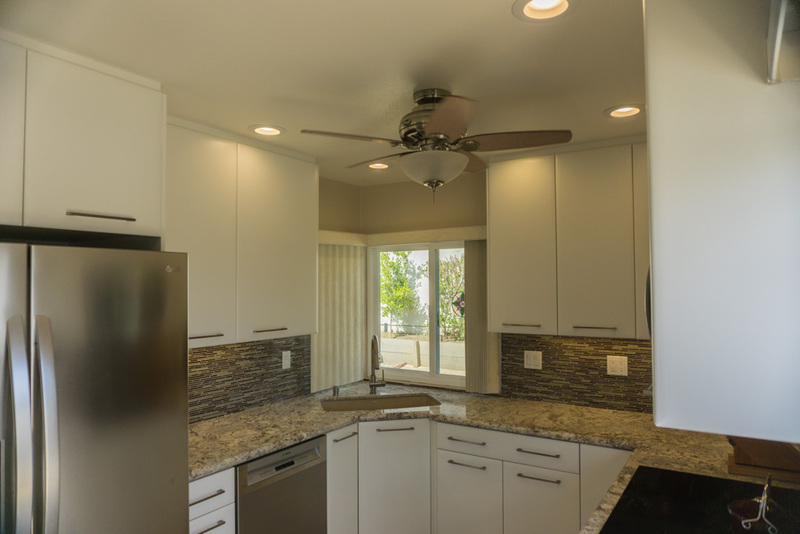 When placing and selecting a ceiling fan for a kitchen this small, it is imperative that you remember to make sure the fan fits without hitting open cabinet doors. 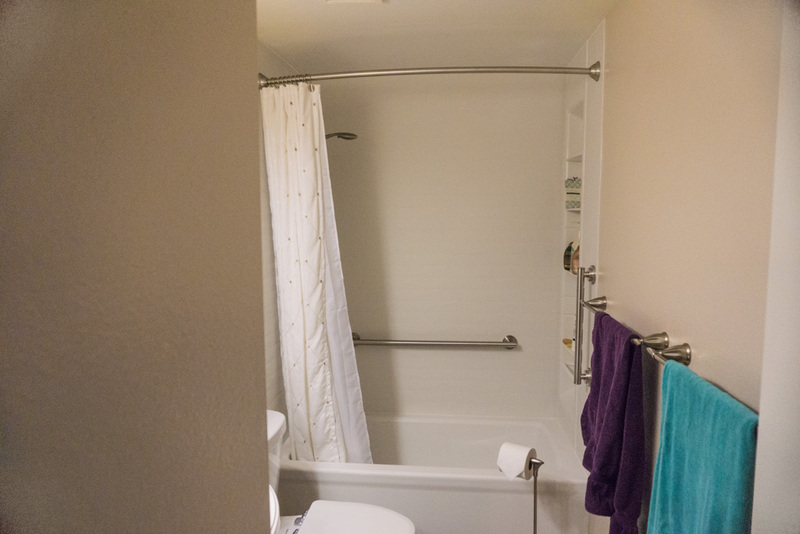 This fan fits perfectly, but that takes real planning and does not happen by accident. 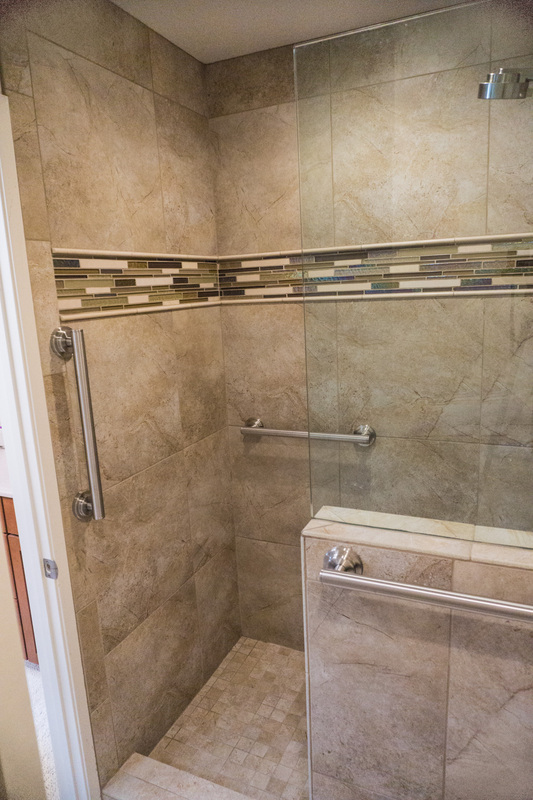 In the shower, as you will see in many of our projects, there is no shower door. 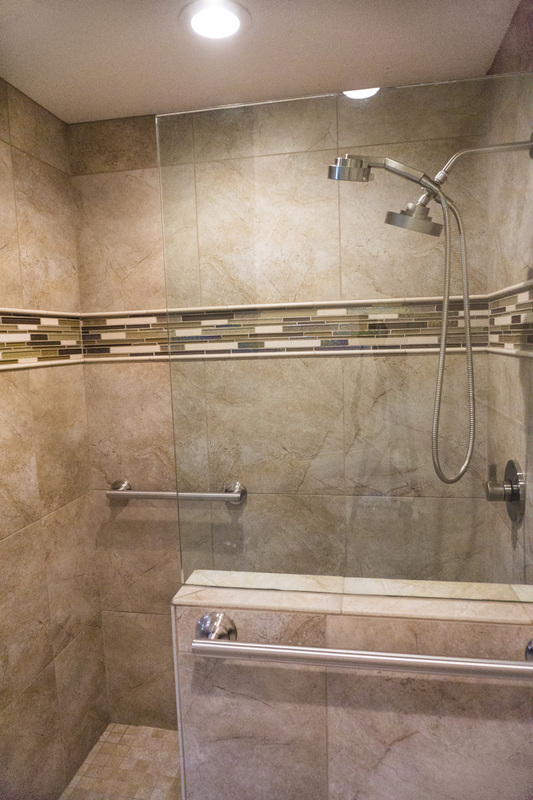 We used the 44” tall half wall with a fixed glass panel above to keep all the water in the shower. 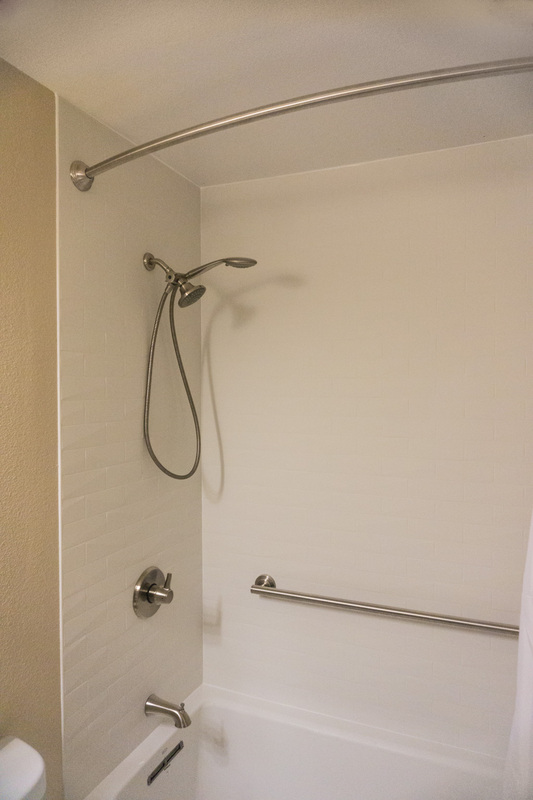 This allowed us to hide the shampoo box out of sight in the half wall, leaving the back and side walls for uninterrupted tile patterns and grab bars, as you see in the pictures. 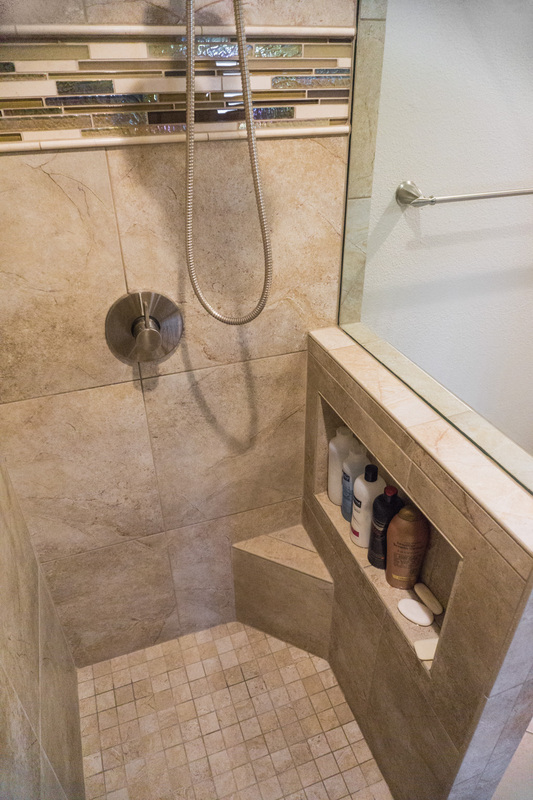 This results in a simple and clean look that is also very functional: with the built-in step, it’s both easier and safer to wash feet and legs without doing a dangerous balancing act. 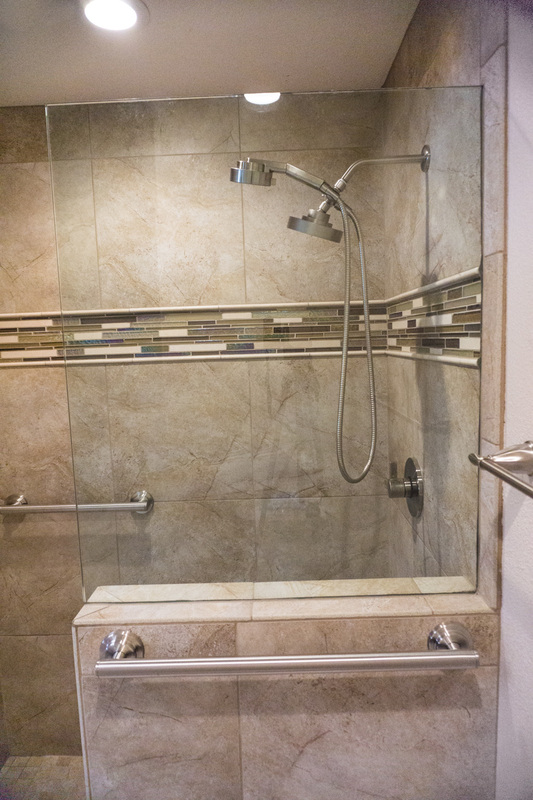 In the tub area in the other bath, we simply replaced the broken plastic enclosure with a new Kohler Choreograph series tub system. 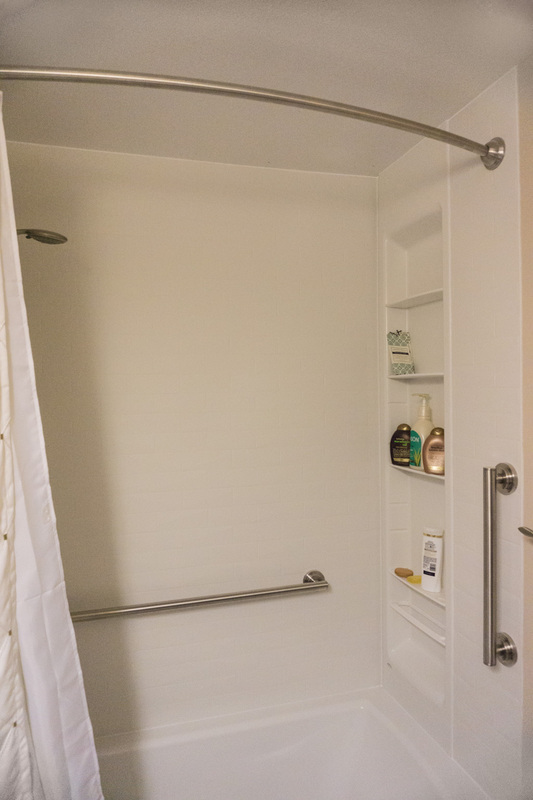 The wall kit in the system was run all the way to the ceiling, and was complimented with the shower locker kit to provide in-wall storage options for the bath.